It’s no secret, I love Markdown. But when it comes to collaborating with someone, Google Docs, Quip, Pages on iCloud.com and Word on Office.com are all rich-text editors. Meet Canvas, a real-time Markdown editor on the web and now on iOS. With this editor, I can see myself collaborating on stories with my coworkers and seamlessly put the result in our CMS. Markdown is a markup language for writers, especially those who write for the web. It lets you write and format text using plain text and easy-to-remember syntax. So instead of blindly relying on a rich-text editor and clutter your text with HTML syntax, Markdown is a nice alternative. In addition to that, many apps and services now support Markdown, making it a popular standard on the web. I like this missing UI, it reminds me of many other Markdown editors I’ve been using. Canvas also automatically collapses the markup so that it doesn’t get in the way once you read back what you’ve written. 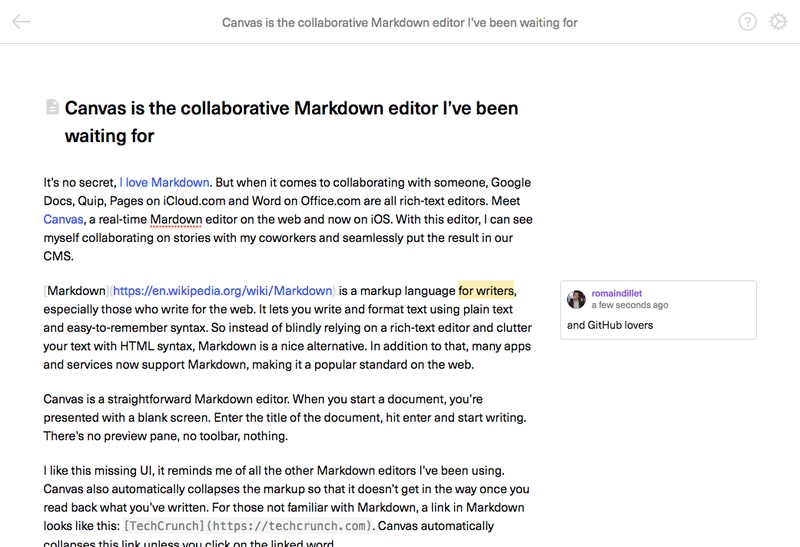 For those not familiar with Markdown, a link in Markdown looks like this: [TechCrunch](https://beta.techcrunch.com). Canvas automatically collapses this link unless you click on the linked word. If you want to share a document with someone, simply copy and paste the URL in the address bar. By default, the other person will only be able to view the document, you can activate the edit features for guest by clicking on the gear icon in the corner. Canvas also added a few collaboration features. In addition to letting multiple people write at the same time, you can also add comments like in Google Docs. I already use Markdown for all my writing. On my Mac, iPhone and iPad, I use Ulysses and sync my articles between all these devices. With this setup, I can start writing a post on any device and pick it up on another. Ulysses recently added native WordPress exporting, making it even easier to publish my post on this website — TechCrunch runs on WordPress. But what if I want to write a story with a second person? I’ve relied on Google Docs until now. Start a document, share it with a fellow writer, write the article, then copy and paste the document into Ulysses, format it and export it to WordPress. With Canvas, I can replace Google Docs and skip a step. Canvas lets you copy and paste Markdown by selecting text in your document. You can also view your file as raw Markdown by adding .markdown at the end of the URL, or export it to HTML by adding .html. Unfortunately, Canvas renders the HTML in the browser so you have to view the source of the page to select the HTML. I hope they’ll add a way to copy and paste the HTML formatting directly on this export screen. WordPress supports Markdown and HTML, so I can just copy and paste the Canvas document into WordPress once I’m down writing it. As for the new mobile app, it works exactly the same way. You can view and edit your files in real time from your iPhone or iPad. You can then export them using the standard iOS share sheet. It’s a bit harder to write in Markdown on a phone as you have to hunt for some special characters, so Canvas should add a shortcut toolbar above the keyboard to make this easier. You can already format a paragraph by swiping left and write, but I couldn’t find any gesture to italicize or add links. I’m quite impressed with Canvas and I plan to use it. It’s a solid collaborative text editor and a good addition to my writing setup. Of course, many people don’t want to deal with Markdown. But for the nerdy writers like me who find plain text more powerful than a Word document, this one is for you.